Wooden City Block Stacking Train is a very clever multi purpose toy. This beautiful train comes with 21 stacking blocks. Five of the 21 blocks are little cars and 1 long bus with working wheels. These five blocks also stack onto the trains 2 carriages. 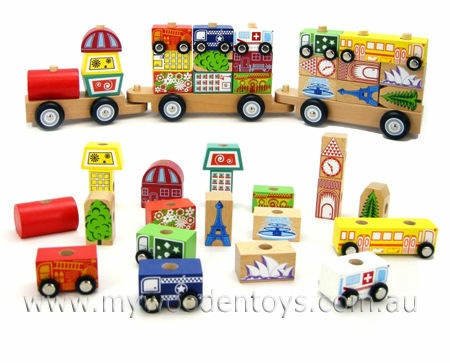 The blocks all stack onto the trains uprights and all of them have different things painted on them including the Eiffel Tower and the Sydney Opera House. So you can take your train on a round the world trip un-stack it build a city and then move on. very well thought out this multi use toy will become a big favourite. Size: Length 46cm height 11.5cm width 6.5cm. Material: Wood, Childsafe paint, plastic wheels. We like this because: "So many different ways to play with this lovely toy."